When the new year rolled around, we finally became tired of making Leighton a separate meal almost every night for dinner. Since the first night that we gave her a plate with the same food we had, she’s become a good bit more adventurous and will usually try at least a bite of everything on her plate. To our surprise, asparagus and green beans have become a couple of her favorite foods, and we’d never have known that if we hadn’t put them on her plate when we were eating them. Some huge milestones she accomplished this spring/summer: moving to a toddler bed and potty training! Both were things that we admittedly held off on as long as we could, but she jumped in headfirst with each challenge and never looked back. She has had only recently started getting out of bed in the morning, but it’s only to grab some stuffed friends and then she gets back in bed and sings to herself until I get her. And potty training went so well that she practically trained herself. I’ve heard so many horror stories on both fronts, so to say we’re proud of these two accomplishments would be an understatement! The most recent, huge milestone is that she started preschool at the end of August! I’ve been both excited for and dreading this time, because it marks a new chapter in her life as she starts her school journey and has something that is all her own without mommy and daddy. She’s in the 2 year old Bunny class (just missed the 3yr class cutoff by 9 days) and will be going twice a week for half days this year. I’m looking forward to having a little more time to myself for work, the gym, and other things while she’s at school… and then going to pick her up and hearing all about her day with her new friends and teachers. Her first day of school was amazing (no tears! ), and when she got back in the car afterward, she said, “I had the best time!” I am so thankful we got into such a great program at our local Methodist church, and I can’t wait to see how much she learns and grows. Disney princess movies, Trolls, Doc McStuffins, Mickey Mouse Clubhouse (especially the “Count Mickula” episode) and Mickey and the Roadster Racers, and The Muppet Babies (or Muffin Babies, as she calls them). We’re going to Disney World for her first trip in October, so we’ve been a little heavy on the Disney movies and characters to get her excited. Snow White and “the funny guys” were her first favorites, but I think Frozen, The Little Mermaid, and Tangled are all top contenders now. I absolutely cannot wait to see her face when we walk into the Magic Kingdom and her Disney friends come to life right before her eyes. She LOVES the pool and everything it entails. Practicing swimming, jumping off the side while singing silly versions of the songs we learned in swim class, playing on the steps and going underwater while holding her breath for a few seconds… I think she was born to be in the water. Needless to say, we’ve spent a lot of time in the pool this summer, which is fine by me. Playing is one of her favorite things, whether it’s swinging, sliding, jumping on the trampoline, “walking the beam” on our neighborhood curbs, riding her trike or little Minnie Mouse four wheeler, making pretend food in her kitchen, doing puzzles, blowing bubbles, giving us and her animals check ups like Doc McStuffins does, or coloring and putting stickers on every surface possible. She is obsessed with the play set at my parents’ house and loves hanging upside down from the set of swinging bars. She just got a bunch of new play food for her birthday and has been busy serving us meals of hot dogs and ice cream, as well as full-on birthday parties, every day since her party. She doesn’t really have many dislikes these days. Being told she has to go to bed is probably one of her least favorite things, and she’ll sometimes put up a fight or start acting like a lunatic when we go upstairs (especially for naps), but she does at least listen and calm down when she realizes there is no other option. Mama is clinging onto those naps like nobody’s business. She has a great imagination and loves making picnic dinners and tea for us in her play kitchen. She’s learning what it means to share, take turns, and be kind to her friends, and we so enjoy watching her play and interact with them. Play dates have gotten really fun because she can do so many things, so we have spent a lot of time at the pool and splash pads, on slip n slides, and at our friends’ houses this past summer. We spent a lot of time at The Battery with friends, which has become one of our favorite local places to hang out. We took our favorite family trip of the year to St. Augustine, FL back in June, and we had the most fun yet with our crazy, hilarious toddler. In addition to wanting to “swim like a fish” all over the Atlantic Ocean, her other favorite activities included sea shell hunting and drawing chalk rainbows on the front deck with my mom. She was so well-behaved at our numerous dinners out, and we had way too much ice cream, just as you should on a proper beach vacation. My dad introduced her to this thing called a “candy store,” and I’m pretty sure her life was changed forever. She is now a very big fan of gummy worms. To celebrate Leighton’s 3rd birthday, we knew we had to have it at The Little Gym where she takes her weekly gymnastics classes. She’s been a little rockstar from the start, and it’s been so fun watching how strong and fearless she is. We hosted her party over Labor Day weekend and invited our families and all of her little friends. Since she still love Trolls so much, we chose that as her party theme, with big Poppy balloons, fun iced cookies, rainbow cupcakes, and Trolls rock candy favors. It was the best party! This year has flown by even faster than the first two did, and I’m sure they’ll only continue to go by more quickly. I’m so very thankful that I have the opportunity to stay home with Leighton during this sweet, exhausting, fun phase of life. I say it with every phase, but this is truly the most fun age so far. It’s bittersweet to watch her getting so big… but it’s even more amazing to watch her grow into her own person. One of my favorite things is when she comes up to give one of us a huge hug and says, “I just love you so much! The whole wide world and the fish in the sea!” Heart. Melted. More than anything, we’re just thankful to have a healthy, happy daughter. Leighton is the greatest blessing and joy of our lives, and I hope you’ve enjoyed following along on our adventures! For the first time ever, I scheduled family photos to take place during our vacation, which coincided with our 9r anniversary. We had our photographer, Megan of Upon Waves, come right to the beach house, because that’s the most special place to us — and it’s just up the beach from where we got married. It started out as a bright and sunny afternoon, but the sky turned dark with rain clouds as we approached sunset, and we got the most beautiful images in return. She let us just be ourselves, so with an almost 3yr old, that meant running, playing, splashing, and collecting sea shells. I am absolutely in love with the images she gave us, and as I told her, I wish I could wallpaper our house with them. These photos will always hold a very special place in my heart. I’ll share a few favorites here, but you can see more over on my MHP blog — or check out Megan’s site for the full post, including a cool story about the beach house! As usual, my mom accompanied us for the week, and we wouldn’t have it any other way. She’s such a fun, easy-going travel partner, and Leighton had so much fun playing with her Mee every day of our trip. She also makes this trip seem a lot more like an actual vacation (because we know that “vacations” with kids are usually not in any way relaxing), and we’re so very grateful for her constant help. My dad joined us for a couple days, and Craig’s brother even flew down from Nashville for a good portion of the trip. It was so much fun sharing our week with family! We had the most beautiful week of weather, so most of our days were spent playing and relaxing on the beach. We did take one day to go to Jax for lunch and visiting with my grandmother, Nana, and some of my mom’s family. Leighton had a blast playing with her older “cousins” (my cousin Alli’s kids), and I just wish we’d had more time to spend together. Next year, we need a big play day at the beach while we’re there. Other than beach time, we got in so many delicious meals, including lots of fresh Florida seafood. If you’re looking for places to eat and drink in the St. Augustine area, I recommend Cap’s on the Water, Aunt Kate’s, Prohibition Kitchen, A1A Ale House, The Columbia, and Tini Martini Bar. Lots of great food, great water views at several of these spots, and just a fun vacation atmosphere all around. There was ice cream had after dinner many nights, and Leighton discovered the greatness that is gummy worms after a trip to the candy store with BaBa. We waited all week to ride the vintage carousel at the park near downtown, and we finally got lucky on our last night. It was the perfect ending to our trip — great dinner, fancy ice cream sammies, a walk through historic downtown, and a couple rounds on the carousel before heading home. This trip is hands down one of the things I most look forward to all year long, and this year was one for the record books. Leighton is at such a funny age where almost everything she does elicits laughter from us, and we had such a great time playing with her on the beach. She’s still a little young to sit for any length of time and just dig in the sand, so we practiced swimming in the ocean, we looked for shells, we watched birds, we built castles, we blew bubbles, we ate popsicles… you get the idea. We did manage to get some relaxing time in when she went up to the house with my mom, though. 🙂 The memories we have from this trip will be some lifetime favorites. 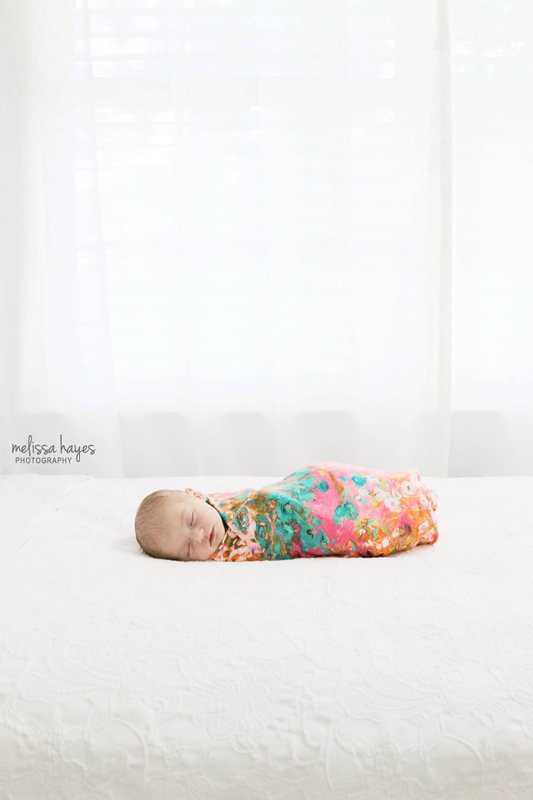 Most of you know that I own a photography business (Melissa Hayes Photography) here in Atlanta, but I don’t share a lot of my work stuff here on my personal blog. I plan to start incorporating some of my tutorial/tip posts and maybe some session sneaks to give you guys a peek into my business and passion. My work is a reflection of my heart and soul, so I want to share some of that with all of you here! 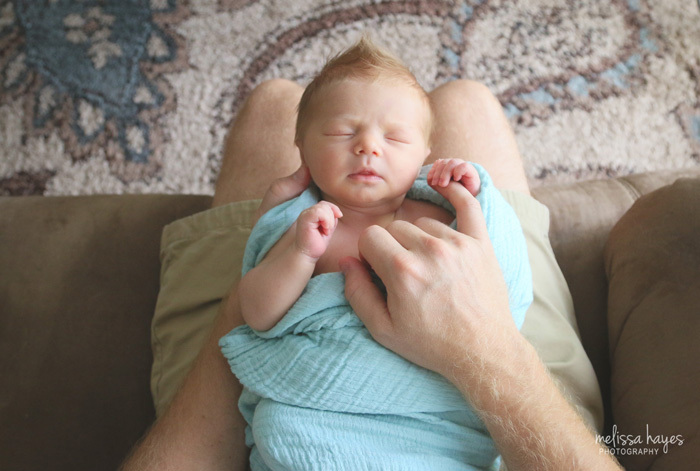 First up — tips for preparing your home for your newborn photo session. So you have a baby on the way (yay!) and have booked a photographer for newborn portraits…. how do you prepare for your session once baby is here? I sometimes get questions or concerns from parents about not having the perfect nursery, or their house is a mess, or they don’t have much space for newborn portraits… but I’m here to assure you that I’ve worked with a variety of spaces and lighting situations, and I can always find a spot to work with. My goal is to capture this special, awe-inspiring time in your lives — so while the backdrop is a component of your photos, it’s certainly not the focus. I’ve compiled my top tips for parents to help make your in-home newborn session as easy and seamless as possible. Before the session, walk around your house to determine which rooms have the best natural lighting during the day. Sunlight provides a beautiful, natural-looking light for photographs. So turn off the overhead lights and lamps (I know you think that’s crazy, but I promise it’s the way to go!) and open up those blinds and curtains. When I arrive, I’ll do a walk-through to find a couple spots that work best for lighting. Even if it’s just a hallway or a guest bedroom, we can set up shop and you’ll never know the difference in your final images. I do have a special love for shooting in the nursery to capture some shots of baby in his or her own space, even if it’s just using the crib or glider for some solo shots. If you don’t have a lot of natural light streaming into your home, don’t worry — I can bring along some extra lights in case they’re needed. How should you dress your family? For parents and siblings, there’s no need to match — coordinating colors/patterns are best for photos. Neutral colors are great because they are pleasing to the eye and don’t compete with the focus of the photos, which is your family! The most important thing is that you feel comfortable and look like yourself. If you can have the baby in just a diaper (swaddled up is fine), then we can easily start photos without having to disturb them by removing clothing. I also love a baby in a plain white or light-colored onesie, so having one on-hand is great. I will provide a few neutral-colored blankets for backdrops, various colored wraps/swaddle blankets, headbands, hats, and a large basket for photos. You are more than welcome to provide anything else you like — a family quilt, a special stuffed animal or outfit, swaddle blankets, headbands, etc. I also have a white noise app that I can play from my phone, but if you have a noise machine or soft music, we can play that to keep the baby calm. An hour prior to the session start time, turn your thermostat up to about 85 degrees. It’ll be quite toasty for the adults, but baby will love it and be nice and cozy, especially when partially or fully unclothed. 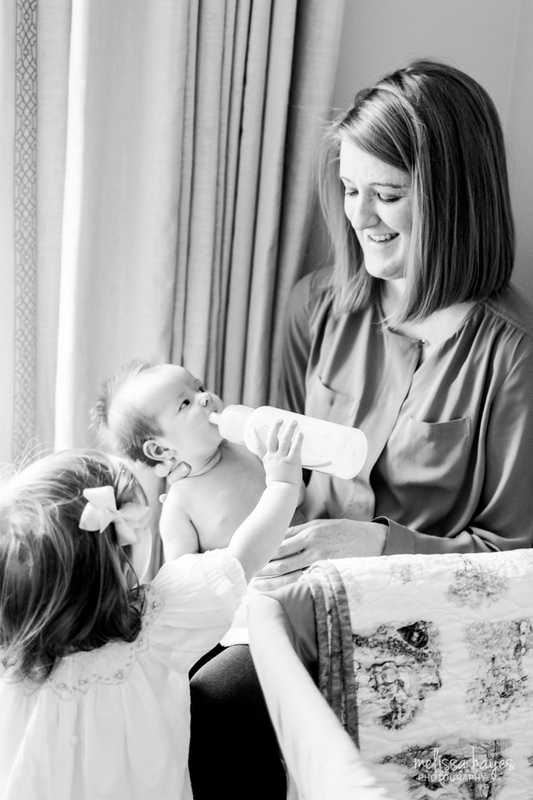 Plan to feed your baby just before the session starts in order to help induce sleep. A full baby is a happy, sleepy baby. It’s also a good idea to have an extra bottle on hand or be prepared to nurse in case they get hungry mid-way through. It may be easier said than done, but try to relax and just enjoy your session celebrating the newest member of your family! You’re here to soak in the newborn smell, the baby snuggles, and the love that created this new life. I’m here to take care of the details and create beautiful images for you to cherish forever. Follow Melissa Hayes Photography on Instagram or Facebook — or sign up for my enews via my website to be the first to get inside info and other fun stuff! This Christmas season was a magical one, indeed. It was so easy to get wrapped up in the festiveness of the season with a two-year-old, even if she did try to sabotage a few of my fun plans, because #toddler. To help guide us through this busy, busy time of the year a little more intentionally (and not miss out on a lot of fun ideas), we did Leighton’s first advent calendar. She didn’t quite understand the idea of it, but she definitely enjoyed the end result. We included a variety of activities, some new and old traditions, some acts of kindness and ways to give to others, and some ways to teach Leighton the true, great reason for this season. There are so many moments I want to remember from this season, this year, with this incredible little toddler of ours. Seeing the look on Leighton’s face when she saw our new Santa and puppy blow up in the front yard. Spending our first REAL, amazing snow day together and decorating our first gingerbread house to pass our time indoors. Listening to her recite the animals and names of everyone in “Christmas in the Manger” as she learned them — our favorite being “Bobby Geezus” for Baby Jesus. Showing Leighton how to roll out cookie dough and laughing about the 1,000 sprinkles she decided to use on one cookie during our annual baking/decorating day with Mee. Teaching Leighton about the importance of giving to others when we make a special outing to fill our shopping cart full of toys to donate to other little boys and girls “to make happy,” as she said. Watching her excitement on Christmas morning when she realized that the Minnie Mouse 4-wheeler (“roller coaster” as she calls it) and helmet under the tree were just for her. Enjoying the madness that is Christmas morning with my parents, beaming with happiness at spending this special day with their children, children-in-law, and two grand babies. Finally making it up to Nashville to extend our holiday celebrations with Craig’s family and sharing so many laughs, meals, and wonderful moments together. BOO! Halloween treats — no tricks! I think it’s safe to say that after this year, Leighton is officially a big fan of Halloween. She still didn’t quite get the whole trick-or-treat concept, but she loved wearing her Olympic Gymnast costume and walking the beam (the curb around the neighborhood) and doing somersaults all over the grass. We dressed as her proud parents in our USA t-shirts, and even Coco participated with an American flag bandana. We decorated her wagon to look like the podium for the medal ceremony, where she of course took home the gold. Team LL all the way! Leading up to the big day, we had lots of fun outings and activities. One of my fall faves is “Scarecrows in the Garden” at the Atlanta Botanical Garden. Leighton would have preferred to play on the slide and rope bridge the entire night, but we did make it around to see the various scarecrow creations with Mee and some of my old puppet coworkers. We got a little more ambitious with our pumpkin carving this year, and it was a family collaboration… Minnie Mouse! Leighton chose the design, I drew it on the pumpkin and cleaned out the guts, and Craig spent over an hour carving the little detailed lines. Leighton was not at all interested in the carving process, but she loved stopping on our stoop to say hi to “MeeMee Mouse” every day. Each holiday we’ve celebrated this year has been so magical with Leighton, and Halloween is no exception. I can’t wait to see her eyes light up for Christmas!